The Strike Industries M-Lok Covers provide unlimited placement options without having to cut anything to size. With single slot pieces, you can plug any M-Lok slot you need and still have the useable slots open for ventilation or accessories, and at the same time provides more dexterity for positive weapon control with the aggressive texturing. 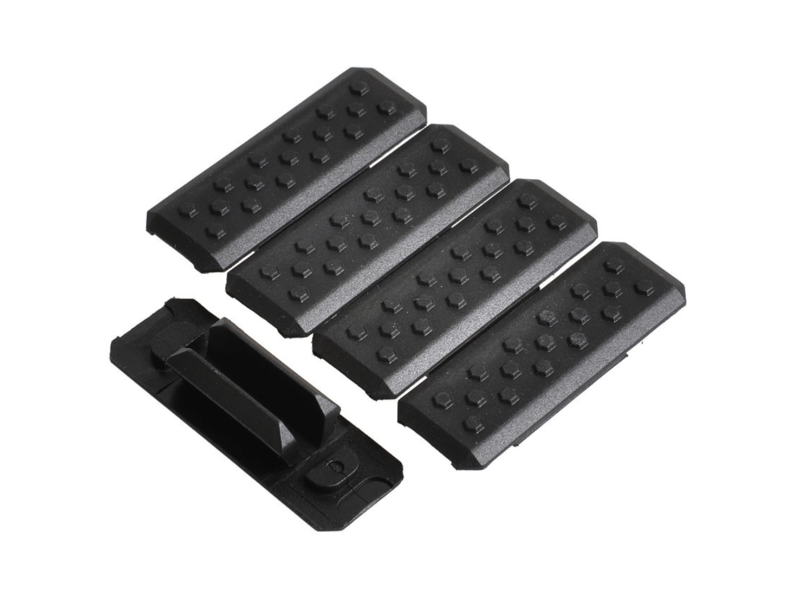 The SI M-Lok Covers are made from a hardened nylon polymer for maximum impact absorption. If an impact is hard enough, the covers will absorb the full blow, cracking or breaking in the process in order to prevent any transmission of shock to the handguard itself. Easy to replace, these covers ensure your rail will not take impact or scratch damage under a covered area, and allow your rifle to stand up to the harshest abuse you and it will go through! Made to fit ALL M-Lok mounting surfaces. Ultra-slim textured surface provides extra dexterity and positive weapon control. Aggressive Non-Slip or Non-Reflective surface. Available in Black and FDE. Sacrificial cover absorbs all impact, protecting your rail system. Each Kit contains Five (5) matching color M-Lok Panels.